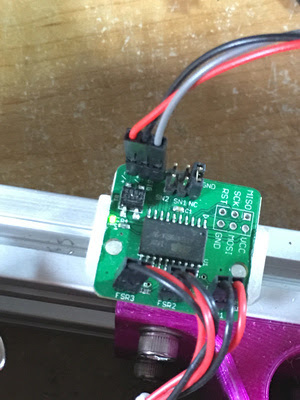 A lot of folks have pinged me for information about setting up FSRs for auto calibration using the Duet controller and dc42 branch of the RepRapFirmware. So I'll document what I've done here. Please feel free to post questions in the comments section so everyone can learn from them. By far the easiest way to interface FSRs is with the JohnSL board. Several vendors sell them singly or in a kit with the FSRs and wiring harness. 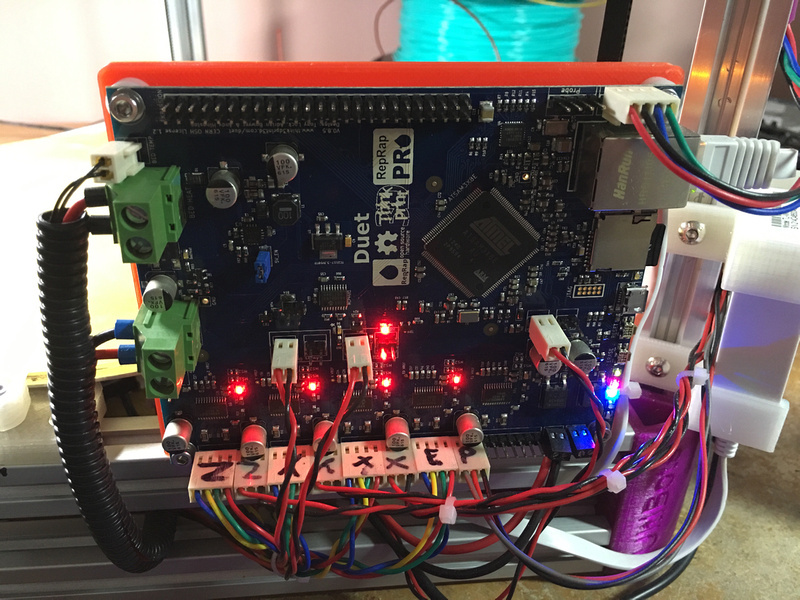 I like the UltiBot FSR Kit as it is competitively priced, the FSRs are the short variety with PRE-ATTACHED connectors (a significant feature), the JohnSL board and the wiring harness. Oh, and there are silicone pads for properly distributing the force on the FSR surface. I've equipped 12 printers with FSRs now and this is by far the easiest route. I'll leave mounting the FSRs for another post as each printer has it's own requirements. To date, I've created printable mounts for Rostock Max, Mini Kossel, Kossel 250 and TAZ 4 and 5 printers. These can probably be adapted to any other delta or Cartesian printer. If you need them before I add them here, let me know. I also have a little JohnSL board holder to attach the board securely to the printer. Here's a photo of a Duet 0.8.5 on a Kossel 250. The Duet 0.8.5 has a dedicated connector for Z probes (upper right corner next to the PanelDue connector in the photo) but the folks at Think3DPrint3D recommended using the extruder end stop connector (labeled P above) for this type of probe (which actually makes the FSR output look like a standard mechanical endstop switch to the controller). The wiring harness that comes with the UltiBot kit to connect the JohnSL to the Duet needs to be modified as the Duet has a different pin ordering than Arduino-based controllers. Take a look at the grey-red-black wires in the photo above. Grey is the Signal, red is 3v3 and black is ground. You can use a needle or thin wire to press the little tab in the connector housing slot to remove and rearrange the pins. The JohnSL board is connected to the other end of this 3 wire harness. The photo above shows the wire order. The JohnSL also has jumpers to set the sensitivity - but leave those alone for now. There is also a jumper to set the switch behavior NC or NO. The jumper MUST BE installed to make the JohnSL behave like a NC switch. That is documented along with the sensitivity jumpers at the bottom of this page. The three FSR wiring harnesses attach to the two pin connectors at the bottom of the photo - the wire color order does not make a difference. It is good practice to twist the two wires to minimize signal noise. The above is configured correctly for the FSR probe. Note the G31 line "Z" parameter. We'll come back to that later but for now set it to Z0. Set the delta radius R to a reasonably close value wither by measuring or using the manufacturer's recommendation. Set diagonal rod length L either by measuring your rods or using the lengths from the manufacturer, set the printable radius B, and set the homed height H to the distance from your nozzle tip when homed to the bed surface - 10mm to give a little clearance for calibration later. Now power up your Duet. Press a finger tip on each of the FSRs one at a time. You should see the corresponding LED on the JohnSL light up and you should also see the LED above the extruder endstop connector on the Duet turn off (it is normally lit up with an NC switch). Once you've verified everything is working correctly, you can mount your FSRs and button up the installation. There are a couple of important things here. Firstly, read my comments on the S value at the top. I always do S=6 calibration. I don't want auto calibration messing around with my delta arm length as that can affect the part X-Y scaling and is easy enough to figure out and set independently. You can do an S=3 or S=4 once you have the machine calibrated, but since it only takes 30 seconds to do a full S=6 I just use that all the time. Also note the commented out M98 lines. FSRs do not retract! I left them here commented out as a reminder since the default has them uncommented. Next, you need to set the bed probe points. David has a nice web-based bed.g file generator here to sett all of this up. I use 13 point, 6 factor with a probing radius = 100 for my calibration above. TIP: it is best to start with a smaller probe radius than your bed actually supports to make sure your hot end, arms, carriages or wiring interferes. You can then sneak up on the maximum probe radius. Make the edits to bed.g and upload or copy it to the CF card on Duet into the /sys folder. Everything is ready to go, now what? Now it's time to test and make sure everything is working properly. I recommend doing a dry run with the hot end and bed cold. Once you have things working correctly, you always want to calibrate with the hot end and bed up to printing temperatures. Power up your printer and Home it. Verify that the FSRs are working properly by tapping gently on the bed - you should see the LEDs blink on the JohnSL board and the endstop LED on Duet blink off-on. Test all three FSRs by tapping directly over them. With everything ready to go, enter G32 into the Web interface G-Code console or press the Auto Cal button on the PanelDue. Be ready to turn off the printer quickly in the event of a problem. The printer should home then descend to about 10mm above the bed. Then it moves out and probes each of your probe points, ending with a probe at 0,0. Finally, the nozzle raises 150 mm off the bed (that's the last line in the bed.g file that says G1 X0 Y0 Z150 F15000. You can change that to anything you'd like. If you issue an M665 command, you'll get the calculated delta radius, homed height, and tower position offsets. M666 shows the end stop adjustments. Once you have calibration tested and working, bring the hot end and bed up to temperature and run calibration (G32) again. If your deviation is too high, run auto calibration again. Sometimes 2-3 runs will improve things. If after 3 runs it is still too high, I recommend checking your printer carefully for mechanical issues. In particular, check that the FSRs are triggering reliably with little force. After you have a good calibration, you can transfer the M665 and M666 values to your config.g file so the next time you start your printer, you are ready to go. I find calibration so quick to perform that I just run G32 everytime I startup my printer. In fact, you can add a shortcut to the Duet Web Control menu for it. Click the Settings menu and the List Items tab. In the Add new G-Code box enter G32 for G-code and Auto Calibrate for the description. Click Add G-Code and Apply Settings. Now you can run Auto Calibrate from the pull-down menu at the top left of the Web Control screen. Once you have FSR based auto calibration working you may find that it needs a little tweaking to set Z=0 properly. FSRs require force to trigger. Depending on how rigid your bed and FSR mounting system is, you may get a little flex before the FSR triggers. This can result in the nozzle being too low - the nozzle will drag on the bed on the first layer or the layer height will be too thin. The G31 line in the config.g file can offset this. I have a very rigid bed and mounting system and find I need -0.05 mm compensation using the Z parameter for Z probe height. Above each probe point (from the bed.g file) lower the nozzle using the paper grip test. Send G30 S-1 and write that down. Read the trigger height (if you did the above from the web interface, read it there, otherwise read from the PanelDue console). Repat 3 - 5 several times and average the results. I like to do 3 probes. Repeat 1 - 6 for each probe point from the bed.g file. Edit the G31 Z parameter in config.g to the trigger height you measured at the bed center: X = Y = 0. I'd like to thank David Crocker (dc42) for his great firmware and guidance in understanding his probing and configuration. 30 comments to ''FSR Auto Calibration Setup for Duet Controller"
Great writeup. I was able to get the Duet installed, commissioned, calibrated, and printing in a few hours on our K250VS-BSE Delta. Thanks for the link to UltiBots and support of our FSR kits. Glad it helped Brad. I corrected the spelling to "UltiBot", sorry about that. Good products and companies deserve to be called out. Any chance you could upload the mounts for the Rostock Max V2 to thingiverse. That would be v. helpful. Thanks for your guidance it has been super helpful. Yes, I'll do that when I get home later this week and put a link here. H = (trigger height measured at the point) - (trigger height at the bed center)"
little confused, I don't see H parameter in the bed.g sample file you have posted. Where do I enter that parameter? Did not know about the jumper for setting the JohnSL board to NC, thanks for the tip. Thought it was causing homing problems (and it might have been), though appearently I had swapped my X and Z motors. Question though, when I run the AutoCal, the nozzle drops to the bed and pushes /drags on it through out the entire probing process. In Rich Cattel's Marlin calibration, it would probe the bed from 5mm or so before moving to the next point. Nevermind. In the default gcode, I thought it said to overestimate the bed height which was contrary to what you wrote...bed height minus ten. You were right, my bed height is roughly 160 and entering 150 in the config.g file worked perfectly. Overestimating (165) was causing the dragging during the probe. Thanks again, glad I found your blog. The behavior should be that the nozzle comes down to within a few mm of the bed, travels to your first probe point, probes, next probe point, probe, etc. I'd like to point out that link to David's web-based bed.g generator is broken. Your "http://for%20my%20calibration%20above/" should be "http://escher3d.com/pages/wizards/wizardbed.php"
Thanks Mait, I'll fix the link in the text. Cheers! Could you add tags to this to make it easier to find? This page was the missing puzzle piece, in conjunction with "converting the rostock to Duet Wifi" and "new FSR bed system". Thanks! Done! Sorry about that, I do try to tag things but this one got away from me. Hi Michael - I've been following your work in my quest to get my Rostock Max V3 into service and have completed the Duet Wifi/JohnSL FSR/E3DV6 upgrades, but can't seem to get my machine to level correctly. I always get high spots on the order of 1-2 mm in the sections of the bed between the towers. This seems to be an issue with the delta radius calibration, but no matter how many times I run the calibration routine nothing helps. I did go through the process of adjusting the H values in the bed.g file, which helped a little. Right now the delta radius the Autocal settles on is around 144.2mm. Any idea what could be going on? Thank You! Save and then run this macro. It will probe and report it's results on the console without changing the calibration. Run it 3-5 times and then compare each of the probes points across all runs. They should all be remarkably close, if not, you have an issue with probe triggering. If you used my printed FSR mounts, there could be slight binding in one or more. The other thing to be aware of is a lot of people are observing what we call the "taco effect" on V3s. Basically the probes near a tower are low and opposite are high, so you get a wavy set of probe points for both the outer and inner radii in the probe set. If you have H values in the G30s in your macro, remove them first (only from the macro for now). I ran the test you suggested using S-1 and verified these findings. I'm using your bed design from trick laser. The FSRs are stuck to the Rostock V3 top plate, with one rubber pad stuck on top of each. Right now the melamine bed is just sitting on top of the rubber pads. The Onx PCB is stuck to the melamine using the recommended tape and a glass palte sits on top of that, which is currently stuck in place with Kapton tape along the edges. I'm intending to make swivel clips for the glass plate as soon as I can print something reliably. Thanks for any suggestions you might have! I've been following your blog/forum posts for guidance as I upgrade my Rostock Max v3 to Duet Wifi and FSRs for probing. So far, it's been going great. However, as I was running the autocal G32 I couldn't seem to get a deviation value of less than around 0.15~, which is not really close to the 0.05 you recommended, even after multiple autocals (all consistent around 0.15). There does not seem to be any obvious mechanical issues with my FSRs (using your new plate, LEDs trigger on very light taps across the entire bed). Do you think perhaps my glass bed or buildTak on top of that may have inconsistencies, or perhaps it is another issue? Hi Leon. Large deviations like you are seeing can be due to a number of things. You've done the first thing, which is make sure the FSRs are not binding or restricted. The plate really helps eliminate that issue, but how are you attaching the plate to the printer and FSRs? I simply dab silicone on top of the FSR pad and press the plate in and let cure. Sorry for posting here again. I followed your instructions to create that probe macro, and generally the probes have been pretty consistent, but I'm noticing a trend that probe points in-between the towers seem to be lower than at the towers themselves (probe test results in positive-negative-positive-negative... output, using points from your bed.g file for the Rostock-Duet conversion). My setup has the Onyx floating on your plate on the silicon pads on the FSRs mounted to the Rostock panel. For some reason getting rid of the double sided tape I had attaching your plate to the silicon pads seemed to drop my deviation to around 0.12-0.13 (odd?). Any ideas on what could be causing the problem? I feel like I should try to converse with you in a more convenient method, such as email. However, the issue you are experiencing is due to the Rostock MAX's geometry as best we can tell. The way I deal with it is to reduce the outer probe radius by 10mm or so. The further in from the towers you probe, the better the deviations will be. I can describe why in an email. Meant to add, I doubt there's an issue with the plate or buildtak but the above test will shed some light on that. I just wanted to say thank you again for your help! I was finally able to get a decently flat first layer by reducing my 13 point calibration circle to 85MM in diameter. I can now print out to almost the entire bed diameter. The last issue I'm still having is inconsistent overall Z height due to some filament oozing out of the nozzle during the startup calibration (which I'm now doing before every print). Right now I have to watch as the first layer starts and manually adjust the "Z Baby Stepping" offset up or down to get the layer just right. Do you have any suggestions for getting consistent initial calibrations? Is there a way to wire the "peek" fan similar to the RAMBo where it is on when the hot end is on and then shuts off below 50C? So I've dialed my height back to avoid crashing into the bed. I'm trying to do auto calibration and have ran into two issues. I get the following error message on all probes. "Z probe already triggered at start of probing move". Also on one of the points the stepper motor slaps the z tower. I'm using a titan aero mount. I also wanted to give back a little bit by sharing the spring tension bed clip I thought of, printed, and have successfully utilized. Maybe I dont want to keep tightening or untightening a screw in this wood if I have to remove the glass. So I put a spring on a wood screw, and designed a bed clip that restrains the glass with the spring in mind. I'd like to send you that file and a picture of the setup if I could, if others would find it useful that is. Just checking in to say thanks, and that I did this. It worked. I like the FSR's, my first layer was perfect.